Dominique Aegerter (Kiefer Racing) mastered the soaking conditions at Misano to take his second ever Grand Prix victory, under pressure from title challenger and compatriot Tom Lüthi (CarXpert Interwetten) throughout until pulling away over the final laps to take the first win on a Suter since Valencia 2014. 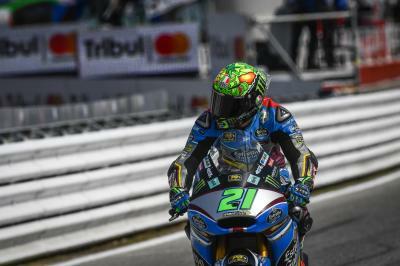 That was a headline, and the San Marino GP wrote a few more as Championship leader Franco Morbidelli (EG 0,0 Marc VDS) crashed out of the lead early on, meaning Lüthi hops up to only nine points off the top of the standings after his second place finish. Completing the podium was another newsworthy performance as Hafizh Syahrin (Petronas Raceline Malaysia) put his wet weather pace to good use to join the first ever Swiss 1-2 celebrating on a rainy rostrum. It was Morbidelli who got the best start as polesitter Mattia Pasini (Italtrans Racing Team) lost out slightly off the line, and the EG 0,0 Marc VDS rider soon began pulling away in the lead. 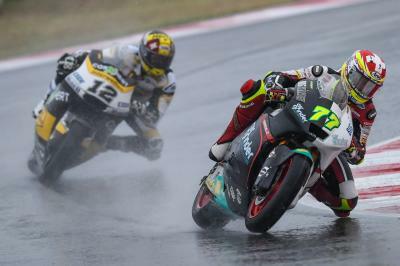 But it wasn’t to be, crashing out soon after and leaving a Swiss 1-2 as Aegerter led Lüthi. Pasini then crashed out soon after that, followed by Miguel Oliveira (Red Bull KTM Factory Racing) - but the frontrunners held firm. 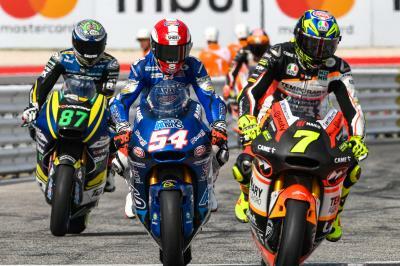 The two Swiss riders remained locked together for much of the race, with Aergerter ahead bar one mistake that allowed his compatriot briefly through. But once back in the lead, the Kiefer Racing rider was back in control and held firm under the pressure until pulling away to win by 1.4 seconds. 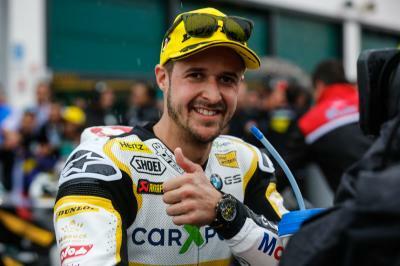 Lüthi took second to make up huge ground in the Championship, with Syahrin threatening to close for some time before eventually taking third and his second ever podium finish. Francesco Bagnaia (Sky Racing Team VR46) kept calm and carried on in torrential conditions for another incredible rookie result to take fourth, with reigning Moto3™ Champion Brad Binder (Red Bull KTM Ajo) another newcomer with a top result as he completed the top five. 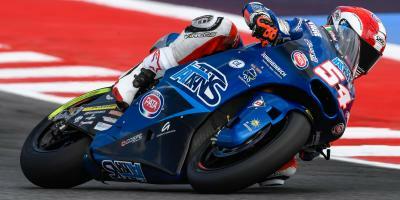 Sandro Cortese (Dynavolt Intact GP) came back with a solid sixth after a tough weekend. Fabio Quartararo (Pons HP 40) took an impressive seventh as another top rookie, although the Frenchman was served a short time penalty and had crossed the line ahead of Cortese. Simon Corsi (Speed Up Racing) was next over the line despite late drama – crashing at the final corner but able to get it to the flag in eighth. Khairul Idham Pawi (Idemitsu Honda Team Asia) took his best ever result in ninth position, with Jesko Raffin (Garage Plus Interwetten) a good margin back to complete the top ten. Eleventh was Takaaki Nakagami (Idemitsu Honda Team Asia), winner at Silverstone, after the Japanese rider was another late crasher but remounted to take points. Alex De Angelis (Dynavolt Intact GP) crashed twice but scored as he took P12 in his home GP, with a similar story for Remy Gardner (Tech 3 Racing) in thirteenth and Tetsuta Nagashima (Teluru SAG Team) in fourteenth. 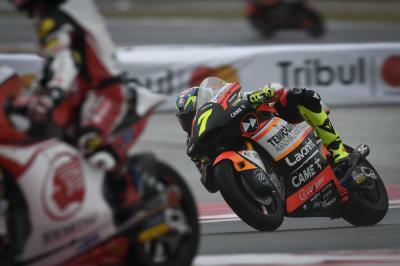 Xavi Vierge (Tech 3 Racing) completed the points. Next up is Aragon and a very different racetrack once again – with the margin at the top now cut down to nine points and Morbidelli looking to bounce back quickly. The full race session at the #SanMarinoGP of the Moto2™ World Championship.